It’s devastating to lose your job. The feeling of not being, wanted or not being of value after faithfully serving an organization is difficult to comprehend or understand. These were some of the thoughts and feelings expressed by 165 Kg (360 lb. 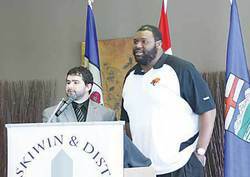 ), 1.98 m (6 ft. 6 in) Patrick Kabongo at the Wetaskiwin Chamber of Commerce Business Luncheon on February 25th, 2013. Kabongo had proudly and successfully served the Edmonton Eskimos for eight productive years. He was on a holiday when he received an email from the Edmonton Eskimo organization. Eric Tillman who was the General Manager (at the time and later fired) was advising him they no longer required his services. It’s easy to understand Kabongo’s surprise. He had been named the Eskimos Most Outstanding Player in 2009, most Outstanding Offensive Lineman in 2009, CFPL Pro Player All Star Team in 2007/08. He had played in all 18 games for the Eskimos (all starts) and was named to the 2010 CFL Player’s Association all-star squad. In 2011 he played 18 games (12 starts) at right guard. He also started the Western Semi-Final and Western Final. And there he was, without a job. Kabongo found himself facing two choices when he was released and was contemplating, “What do I do? I can get down on football or I can sell myself to another team.” On June 4th, 2012 he came to a contract agreement and signed with the BC Lions. Kabongo has successfully matched his skills with his use of social media to brand and market himself, not only in sports but in other business endeavors. “Businesses must think of different ways they can promote and market themselves. You need to change the thinking of the consumer to have them buy local. How does the 24/7, 365 day website help improve your business. How does it bring money?” Kabongo left the audience with the thought, “It’s a new generation and business owners have think of different ways. Think outside the box of how they market themselves and their business”. Standard booths in the Agricultural Hall are 10’x20’ and the cost to Chamber members is $500 and non-Chamber vendors, $575. There is an early bird discount of $50.